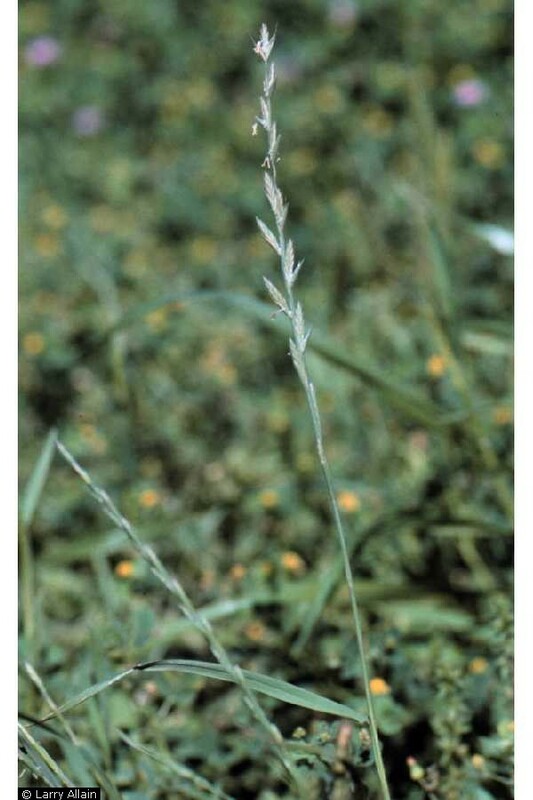 Lolium perenne.© Larry Allain @ USDA-NRCS PLANTS Database (Accessed 5/2014). Lolium perenne Short-lived perennial C3 grass (Wand et al. 1999), tufted; stems 30-90 cm, slender. Leaves less than 0.4 cm wide basal leaves short, fine. Flower spikelet 5-22 flowered, glume single on outside edge of spikelet, 0.4-1.2 cm, herbaceous, shorter than spikelet, lemmas with or without awns, lowest 0.2-0.8 cm, reduced upwards; Inflorescence spike 10-20 cm, spikelets on outside edge, along opposite sides of rachis, edge-on to it, fitting into a depression on rachis; May-Aug.
Habitat: Common lawn grass, also along edges, fill, roadsides, other open areas, soil pH 5-8, tolerant of salt, intolerant of shade, drought and fire (USDA, NRCS 2010). Notes: Often infected with an endophytic fungus, Acremonium sp., Neotyphodium sp. or Epichloë typhina (Clavicipitaceae, Ascomycetes), that renders the grass toxic to cattle and horses. 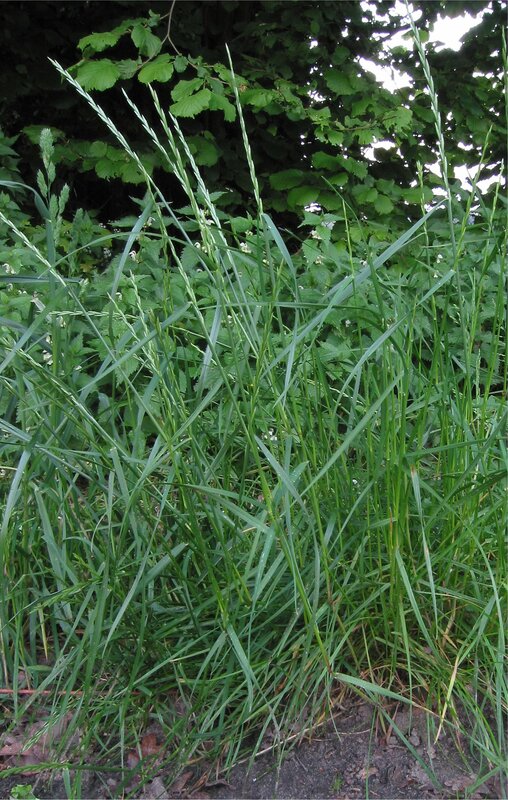 Infected grass plants generally grow better but are often rendered sterile by the fungal infection. In fertile plants, the fungus infects seeds and is carried into the next generation as part of the plant reproductive process (Clay 1988; Wilson 1995a; Clay and Leuchtmann 1989; Schardl and Leuchtmann 1999). A study of the interaction among endophyte infection, aphids (Homoptera, Aphididae) that feed on Lolium multiflorum (L. p. var. italicum) and a parasitoid wasps that kill aphids, show complex interactions among plant endophyte, parasitic insects, and their parasitic (parasitoid) predators. The parasitoid wasps, (Hymenoptera) parasitize and kill aphids by laying eggs on their bodies. The larvae develop inside the aphid, mummifying it. These wasps, in turn, are preyed upon by hyperparasitoid wasps that lay their eggs on the primary parasitoid or the parasitized aphid. Endophyte-free grass had three times the density of aphids as infected grass populations, but aphids on uninfected grass suffered higher rates of attack by parasitoids. However, primary parasitoids on endophyte free grass had higher rates of attack by hyperparasitoids and did not succeed in increasing their overall rate of reproduction (Ornacini et al. 2001).